SOLD [MULTIPLE OFFERS] $1,895,000 STUNNING FUSION OF OLD WORLD CHARM WITH MODERN COMFORTS WELCOMES YOU TO THIS RARE FIND. Enter a world of enchantment, architectural character & lush surroundings. Wine Country found in the city! Professionally designed COURTYARDS & SWIMMERS POOL welcome family& friends. 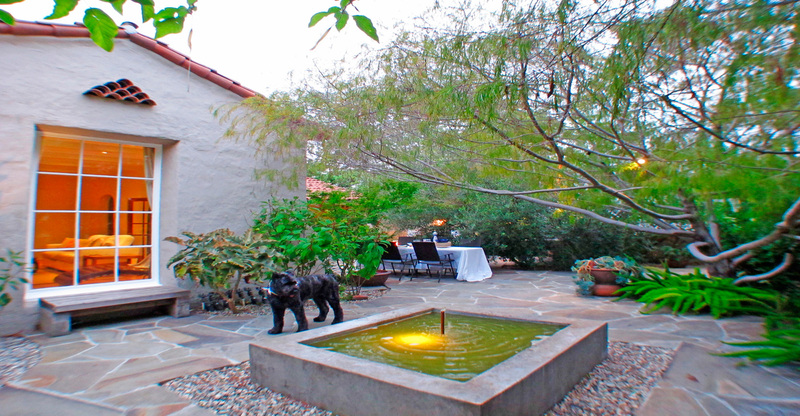 Specimen landscape enhanced by masonry fountain, fire pit, & built-in seating areas refresh the spirit. This QUINTESSENTIAL 1927 Spanish maintains original architectural design elements, respected & presented beautifully while presenting CENTRAL AIR, recessed lighting, and beautiful upgraded eat-in kitchen with vintage appropriate restored refrigerator and stove introducing complimentary Miele. A sensational Roman Brick fireplace exudes luxury living & compliments the stunning living room with coved beamed ceiling & charming double doors leading to the outdoor courtyards. Formal dining room glass doors allow for al-fresco dining at its finest. Four bay garage beckons car enthusiasts & is universally used as loft -like artist retreat. By the numbers: 3BA/2 BA 2234sq.ft. 4car garage.